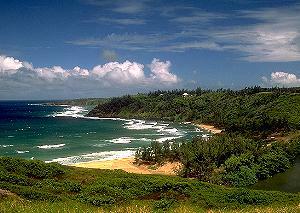 Kauai, voted the "Friendliest Destination" in the United States, is filled with "insider" attractions which are free or less than $20. Major shopping malls have regularly scheduled free entertainment, and most festivals are free. 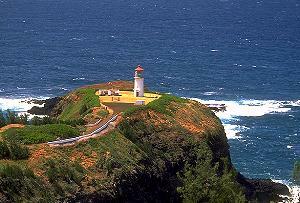 The splendid Kilauea Lighthouse and Sea Bird Sanctuary are gratis, but the Kauai Museum has a $5 admission fee for adults. Golfers find a good deal at the 18-hole Wailua Golf Course for under $20, Monday through Friday. Kauai's most extensive network of hiking trails is in the Na Pali Coast/Waimea Canyon/Kokee region with others near the Wailua River. Hike 28 named trails totaling 45 miles through an unspoiled environment that most visitors overlook. 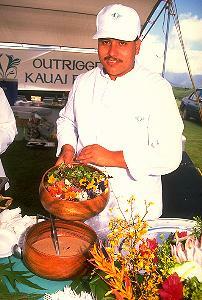 A bonus in 1996 is the Aloha Festivals. The nation's only statewide cultural celebration will be honoring its 50th anniversary with dance, music, parades and ceremonies from August to October. Aloha Festivals, (808) 944-8857. In May, the 8th Annual Taste of Hawaii attracts 30 or so of Hawaii's most distinguished chefs from all parts of the state who prepare their specialty to live music and lots of laughs. Organized by the Rotary Club of Kapaa, call (800) AH-KAUAI for details. The entrance fee is all-inclusive. For homey, mom-pop, Kauai-style dining, stop by the Green Garden Restaurant in Hanapepe to meet the locals and experience a family managed kitchen that has been in business since 1948. Try the seafood curry with mango chutney ($6.50) and passion fruit pie. Tourists have not yet discovered the Green Garden. Aloha Airlines Pass - Aloha Airlines introduces a new seven-day, unlimited Island Pass designed for island-hopping travelers for $199. The line provides travelers with a wide array of fares and, together with its commuter affiliate, Island Air, offers about 300 daily flights throughout the state, with more flights to more destinations in Hawaii than any other carrier. If you like to ride up front, Aloha is the only inter-island carrier to offer first class service to all five of Hawaii's major airports. First class deplanes first and the baggage is delivered first in the baggage claim area. Aloha also has a number of first class lounges in the terminals. Call your travel agent or (800) 367-5250, US; (800) 235-0936, Canada. 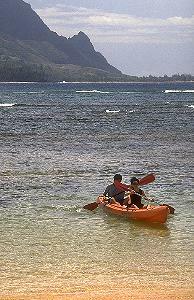 Budget Rent a Car-Hawaii markets highly competitive rates and packages. Call (800) 527-7000 (mainland USA). For the free Official Kauai Vacation Planner call (800) AH-KAUAI; for live updates call (800) 262-1400, or visit the Kauai website.